Generation Y employees expect to be promoted quickly, are already thinking ahead to retirement and want work-life balance and plenty of training opportunities. These are some of the findings of a research study led by Prof Nicolene Barkhuizen of the Department of Industrial Pshychology at the NWU Mafikeng Campus. “Many employers are currently facing challenges attracting, developing and retaining Generation Y employees,” Prof Barkhuizen says. 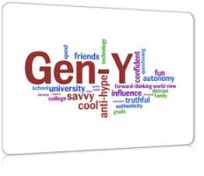 “Our aim was to determine te reward and remuneration practices that will attract them to organisations.” Generation Y is the age group born between the early 1980s and the early 2000s. For the study, 202 final-year undergraduate students completed a survey questionnaire measuring 17 reward and remuneration practices on a five-point scale. “Some of our findings were quite surprising,” says Prof Barkhuizen. One surprise was that the most important employment requirement of Generation Y employees was career development, which came in slightly ahead of a good base salary. Another surprising result was that retirement benefits were the third most important factor for them. The fourth and fifth most important reward and remuneration practices overall were training opportunities and work-life balance. According to Prof Barkhuizen the study has opened up new avenues for further research, and the team is eagerly preparing to delve deeper into the issues uncovered.